The European Economy is currently in a slump, the worst since the 1930s. 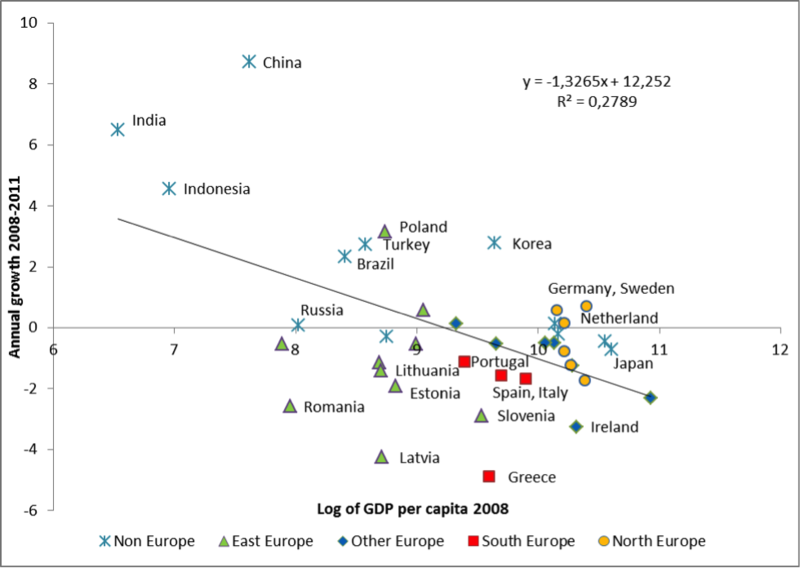 Although this is often seen as a consequence of the financial crisis that hit the capitalist world in 2007-8, we argue that many of the problems that Europe faces today have long term roots to do with the fact that Europe consists of countries with quite different dynamics and capacities for adapting to changes in the global (and European) economic environment. We start by comparing Europe’s growth performance to that of other parts of the world, and then consider some popular but arguably erroneous explanations of the present crisis. Subsequently, we delve into the development of the external balances of various European countries. This leads to the identification of three European “archetypes”, characterized by different adaptability and performance, i.e., the North, the South and the East. We explore the consequences of globalization and European economic integration for the economic performance of these different country groups. The effects have been quite asymmetric; the Southern countries in particular have benefited little if at all. Finally, we consider the implications for policy. We argue that the present insistence on austerity, with economic stagnation, high unemployment (especially among the young) and increasing poverty as some of its main consequences, only adds to the problems caused by inconsistent and inefficient policies in the past (and present). What is needed is a European growth policy, properly adapted to the different capacities across Europe, that places the welfare of the European population as a whole at the center.